← Awesome Gardening Event This Saturday! Hope you’re visiting your local Garden Center this weekend to find more flowers to add to your yards, window boxes and container gardens. 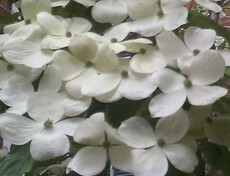 During this past week’s rainy days, my eyes were drawn to the white, bright, beautiful blooms of the flowering dogwoods. Just gorgeous! While I am a huge fan of color in my garden, I was reminded that white flowers and petals can quickly brighten up gloomy days and shady spots! The flowering dogwood is a low maintenance t ree with white, four petal flowers (or bracts) blooming during April and May. It’s a small tree, native to America, growing to 15-30 feet with a low-branching, somewhat flat-topped habit. The actual dogwood flower is small and yellowish green. The flower is surrounded by four, showy petals (bracts) which open flat, 3 -4 inches. What a show these blooms put on! Enjoy it while it lasts. In the early fall, the tree bears bright red berries that the birds love but are poisonous to humans. Make sure to keep your hands off! Happy Spring!!! 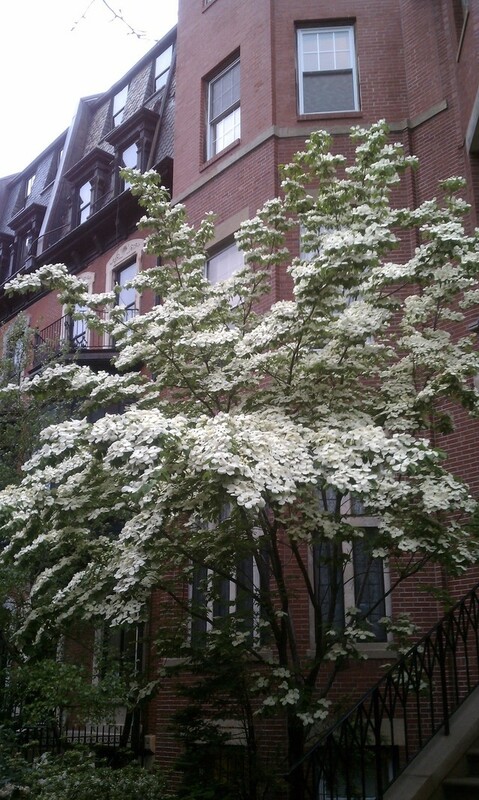 This entry was posted in Flowers and Plants, Local Beauty, Trees and tagged City gardening, Flowering Dogwood. Bookmark the permalink.